“What are THESE guys? ?” I uttered as these morsels strangely reminiscent of mini haystacks was placed before me. 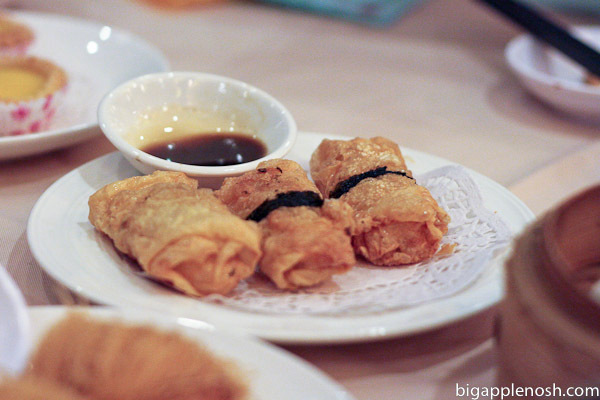 No, I wasn’t anywhere unusual – just a dimsum restaurant in Singapore. I know my dimsum, so it was a pleasant surprise to see how this meal was done differently halfway across the world. (Oh, and those are taro fritters, covered in noodles and deep-fried. You guessed correctly, right? I thought so). 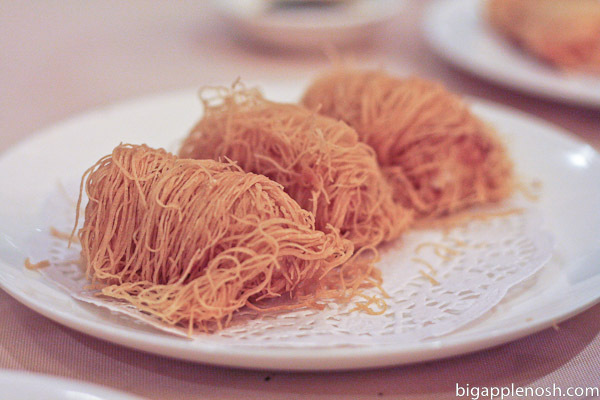 The prawns above were one of my favorite Singaporean dimsum dishes. Aptly named “cereal prawns,” the prawns are friend until crispy and then topped with crushed “cereal” that is slightly sweet and salty. Curious eater that I am, I wanted to know what kind of cereal. Lucky Charms? Frosted Flakes? Cookie Crisp? I still don’t know the answer, but I’ve got a feeling it’s a lot tamer than I think. Any guesses? 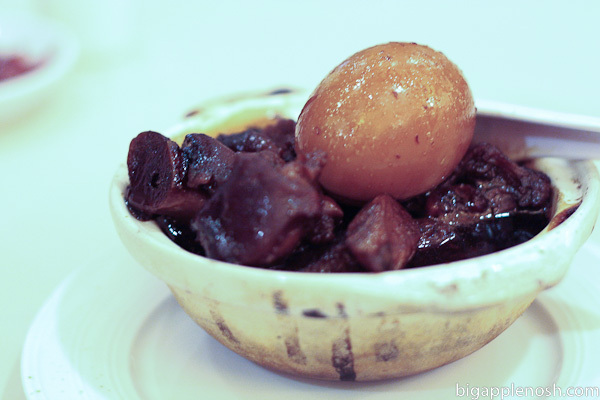 I also enjoyed the pork knuckles and hard boiled egg, stewed in a sweet soy sauce. The meat was fall-off-the-bone tender, with juicy gravy – mmmmm. I next sampled the prawn-meat wrapped in tofu skin. Gotta give it to them, the Singaporeans really love their prawns! Clockwise from the left, we’ve got steamed roast pork buns (char siu bow), steamed custard buns, siu mai, and gnor mai gai (rice and meat wrapped in leaves). Deelish! 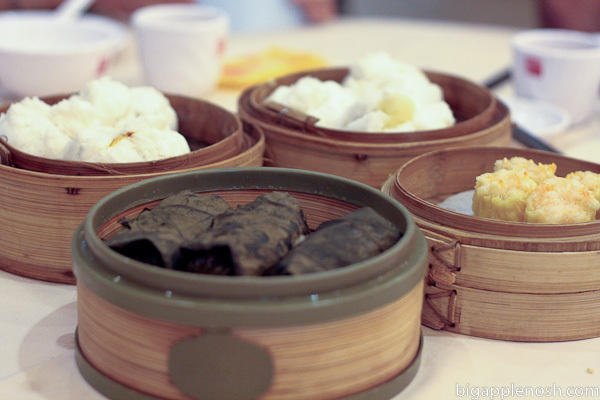 I love dimsum – the variety of dishes is never-ending. Just when I thought I had seen them all, I travel half way around the world where I get to discover even more snacky goodness. My guess is the cereal is Corn Pops because they're my fave but I would probably be disappointed and learn they're only Rice Krispies or something. Haha. The concept sounds delicious though! I've never had dimsum, but omg those pork knuckles look sooo good! I'm going to guess crushed honey bunches of oats is the cereal on the prawns (that's what it looks like to me, at least)! Do they even have that in Singapore?! 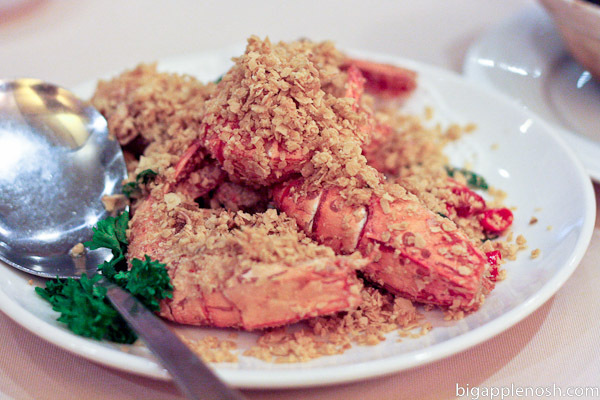 it looks like the Singaporeans do love their prawns. Yum! I've only ever had dim sum in Yokohama, Japan's Chinatown but it was so good. I have yet to venture into San Francisco's Chinatown but I want to soon! That cereal prawn dish looks like it would be my favorite! Yum yum yum. I think I saw a cereal prawn "mix" (like a prepared shake-and-bake type thing) at the supermarket at Takashimaya on Orchard Rd. Pick one up so we can explore the mystery that is cereal prawns. I love the taro fritter. It's one of my favorites. those cereal prawns look amazing. sounds like a delicious dimsum feast! OMG..that is one beautiful presentation of good food! Awesome photos! About cereals.. sometimes when I am out of bread crumbs I am using corn flaks:) …and looking at your photo I would say it is crushed frosted flaks because you said that it is sweet! mmm yummy! i love prawns 🙂 i'm also very interested in trying the taro fritter. Oh you are making me hungry again! Where was this? I've had ok dim sum here but still NY has great (maybe better) options. Haha – great cereal suggestions, everyone! Mrs. Hot Cocoa – I'll definitely keep an eye out for the cereal mix! O this looks so good! I agree the cereal looks a little like Rice Krispies. Ive always wanted to taste something with crunches of corn flakes on it, Ive seen this before and it looks good! 🙂 Was just watching Top Chef AllStars and now Im hungry! the "cereal" is in fact a popular oat/porridge-like instant drink. i think it's made from oats.since it's a drink mixture, the one sold by nestle (and used by cooks for a cereal prawn dish) will include sugar, creamer that makes the dish sooooooo tasty.